Okay, so it took "get-away" day for the Cards to prevent a sweep by the Padres. Yesterday's 8-3 win on the west coast was nonetheless, important. Important for Brendan Ryan, for one, with his 4-for-4 day plus a sac bunt. Only one overzealous miscue at short as well, trumped by a game-ending highlight with a little help from Albert. And speaking of Albert, an important step back toward his awesome self with several lasers to the left side, one of which stayed fair for a round-tripper. For a awhile, it seemed as though Pujols was trying to take Petco apart, using the baseball as a wrecking ball. But the biggest plus for the Cardinals (no, it wasn't that they ran to each base in a safe and forward progress) just may have been the pitching, from starters to middlemen to short relief and closers. The San Diego series numbers had to have been excellent. (Where's a stat-geek when you actually need one?) Hats off to the Diego Boys, BTW. 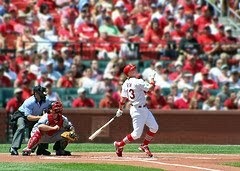 The Cards need only wake up a few more bats and stir up a rally or two and create a smidgen of offense to step up a level. And don't sweat the fact that Freese found out he was actually human over at the hot corner. He had some tough chances, and the with the short memory of a closer, hitting the Windy City has probably put everything-Diego far in the past for him, as well as the Redbird squad. Hey, Chicago is today, and they've been hot lately. First pitch just after lunch, Central Time. Cards ... Cubs ... here we go!